After the outbreak of World War II and invasion of Poland, Father Maximillian Kolbe sheltered refugees including 2,000 Jews whom he hid from Nazi persecution in his friary. Germans arrested him on February 17, 1941 and imprisoned him first in the notorious Pawiak Prison in Warsaw, then transferred him to Auschwitz on May 28, 1941. He became Prisoner #16670. In late July 1941 three prisoners disappeared from camp. In reprisal, the deputy camp commander picked out ten men to starve to death as a deterrent to future escapes. When one man cried out “My wife! My children!” Father Kolbe took the man’s place. All ten men were stripped naked and thrown together to starve in a dark bunker in the basement of Block 11. Every day Father Kolbe held Mass and sang hymns and held the men up in prayer. After two weeks he was the last man alive. The Germans entered, gave him an injection and he died. In a week of new saints and Holocaust Remembrance, it is good to remember and honor the sainted Polish priest Father Maximillian Kolbe (1894 – 1941.) Pope John Paul II canonized Father Kolbe as a martyr of charity on 10 October 1982. Sign reads: Cell in which in 1941 died prisoners sentenced to death by starvation as a result of collective responsibility for escapes. One of them was Father Maximillian Kolbe, the Polish priest who sacrificed his life to save another. 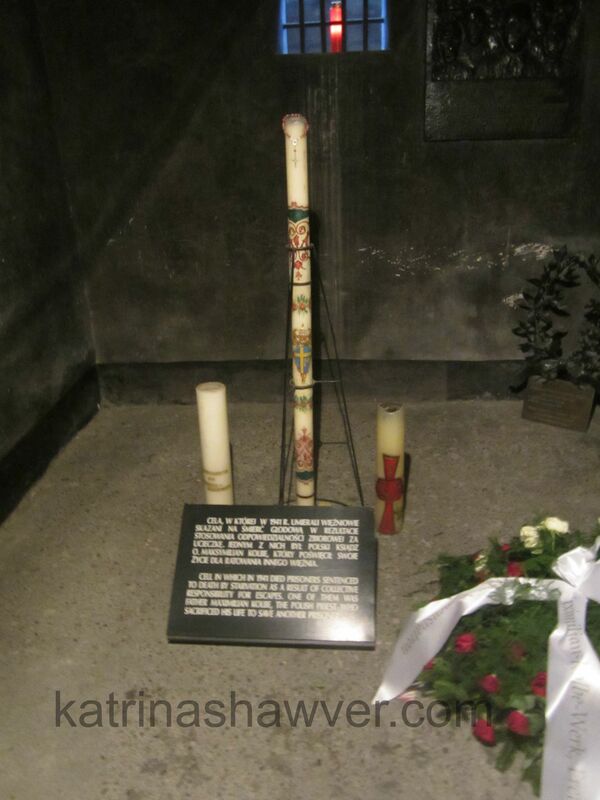 This entry was posted in Auschwitz, Notable Poles, Prisoners of Note and tagged Maximillian Kolbe by Katrina Shawver. Bookmark the permalink. The Monastery he founded, Niepokolanow, is near Warsaw. Before WW2 Kolbe traveled to a mission in Nagasaki Japan where a new monastery was to be built. The site selected according to Japanese Shinto was on the slope of a mountain. Kolbe insisted it be moved to the other side of the mountain, in violation of “Harmony” architecture norms. When the atomic bomb was dropped, the mountain sheltered the monastery and all persons in it, the monastery then served as a refuge and hospital for bomb survivors.